Doxie Go lets you scan anywhere. Yep, anywhere. In a scanning pinch (don’t laugh, I totally have those), I really love the JotNot app. But there’s only so much it can do. That’s why I’ve got my eye on this amazing new gadget that lets you scan anything from anywhere– no computer or cords needed. Simply charge up your Doxie Go scanner and then insert anything from pictures to receipts, all of which scan in about 8 seconds. No computer or cords (thanks to the rechargeable battery) needed. To access your documents, you just sync with your computer via USB or to your mobile device with the free app. If you need to be able to send everything wirelessly to the cloud (Evernote! ), consider the Doxie Go + WIFI bundle, which includes an EyeFi card. You can scan up to 600 pages (2400 photos) with the built-in memory, but if you need more, just insert your USB flash drive or an SD card. And I really like how Doxie Go creates searchable PDFs, making it easy to organize your scanned documents. But best of all, when you purchase this scanner you get everything you need to make scanning magic happen right in the box, which means no scrounging for cords, cards, or even a carrying case. Awesome. 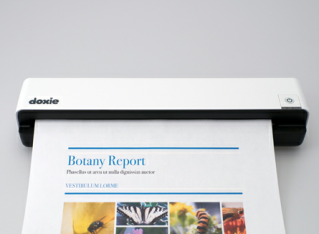 You can purchase the Doxie Go Scanner from their website. And if you don’t need a mobile scanner, check out their other compact scanners. Wow…this little gadget would totally come in handy. I could see myself using this on a roadtrip during the rare moment that both of my kids fall asleep. This would be great to take on business trips or vacations too. For vacations, you could scan those paper items you want to remember, but not add to the weight of your luggage.